In a future release, we’ll be adding support for PRs assigned to Azure Active Directory (Azure AD) groups and teams containing AAD groups. For teams using branch policies, it can sometimes be hard to know exactly what action is required when you view a pull request. If the main call to action is the Complete button, does that mean it’s ready to complete? Using information about the person viewing the page and the state of configured branch policies, the PR view will now present the call to action that makes the most sense for that user. When policies are configured, but aren’t yet passing, the Complete button will now encourage the use of the Auto-complete feature. It’s not likely that you’ll be able to complete the PR successfully if policies are blocking, so we offer an option that will complete the PR when those policies eventually pass. For reviewers, it’s more likely that you’ll want to approve a PR than complete it, so reviewers will see the Approve button highlighted as the main CTA if you haven’t approved yet. Once approved, reviewers will see the Complete (or Auto-complete) button highlighted as the CTA for those cases where a reviewer is also the person completing the PR. As comments are resolved, you’ll see the count go up until everything has been addressed. 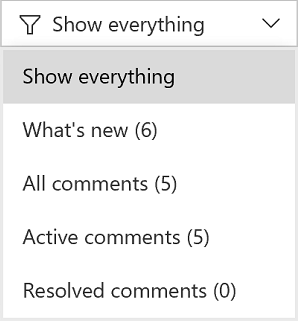 The filter in the Overview has been improved to enable filtering by various comment states and to show the count of comments for each filter option. In the Pull Request details view, the Updates tab has been improved to show when a force push has occurred and if the base commit has changed. These two features are really useful if you rebase changes in your topic branches before completing your PRs. Reviewers will now have enough info to know exactly what’s happened. 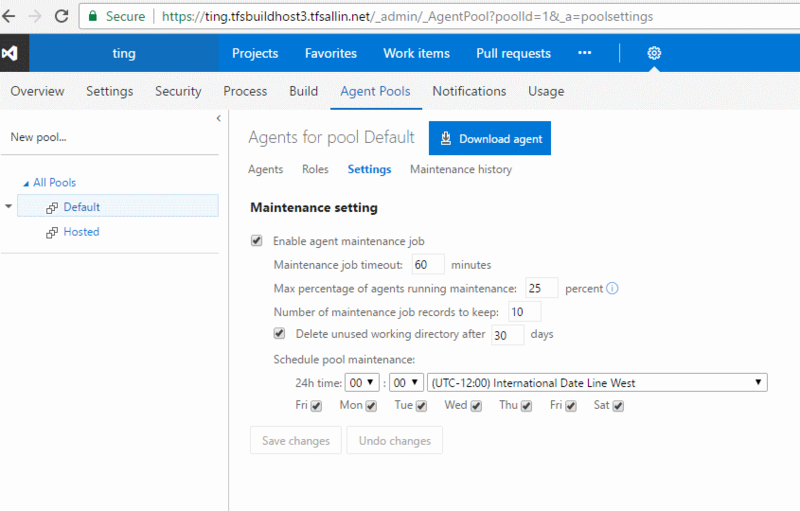 You can now configure agent pools to periodically clean up stale working directories and repositories. This should reduce the potential for the agents to run out of disk space. The maintenance is done per agent, not per machine; so if you have multiple agents on a single machine, you may still run into disk space issues. The agent selection now takes machine activity into account when allocating an agent for a build or release. This will cause a build or release to be sent to an agent on an idle machine before selecting agents on a machine with other agents that are currently busy. Using the Visual Studio Test task, you can now run automated tests using agent phases. You can leverage an agent pool for your testing needs. 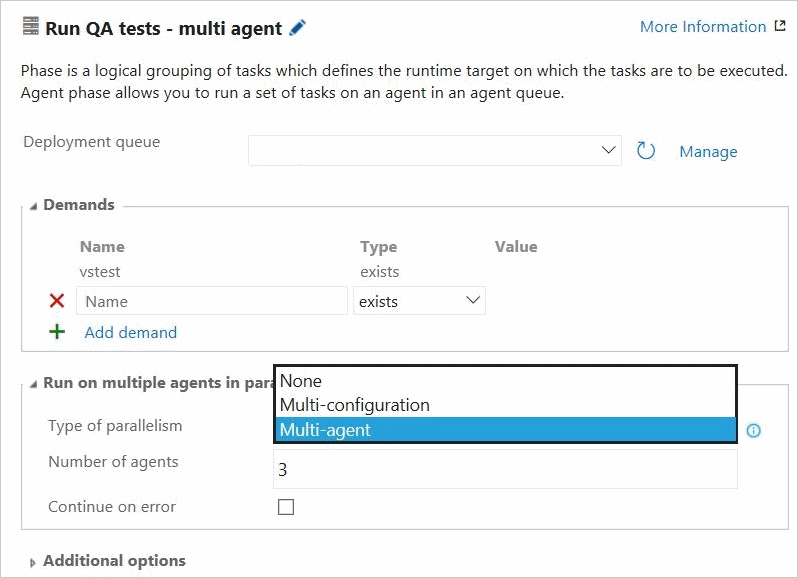 Run tests in different modes using the same Visual Studio Test task, based on your needs—single agent–based run, multi-agent–based distributed test run or a multi-configuration run to run tests on, say, different browsers. For more information, refer to the this post. Extension authors can now create extensions with multiple versions of a given task, which enables them to ship patches for each major version they have in production. See Reference for creating custom build tasks within extensions. Any user or group can be given permission to manage extensions for the account. Previously, only account administrators could review extension requests or install, disable, or uninstall extensions. To grant this permission, an administrator can navigate to the Extensions admin hub by opening the Marketplace menu, selecting Manage extensions, and then click the Security button. Also new this sprint, a user who requests an extension is now notified via email when that request is approved or rejected. We’ve updated the Package Management user experience to make it faster, address common user-reported issues, and make room for upcoming package lifecycle features. 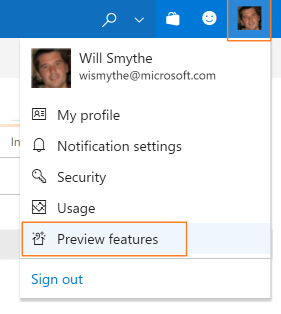 Learn more about the update here, or turn it on using the toggle in the Packages hub. 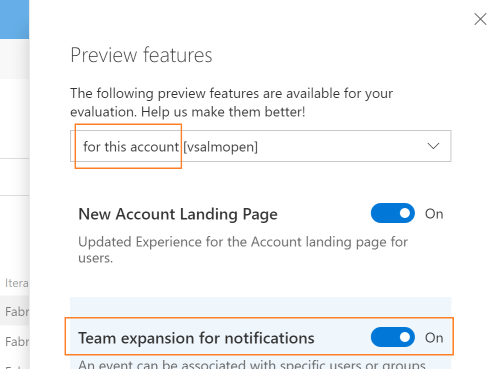 Team Services can now be explicitly selected as the target for Azure Active Directory (Azure AD) conditional access policy. 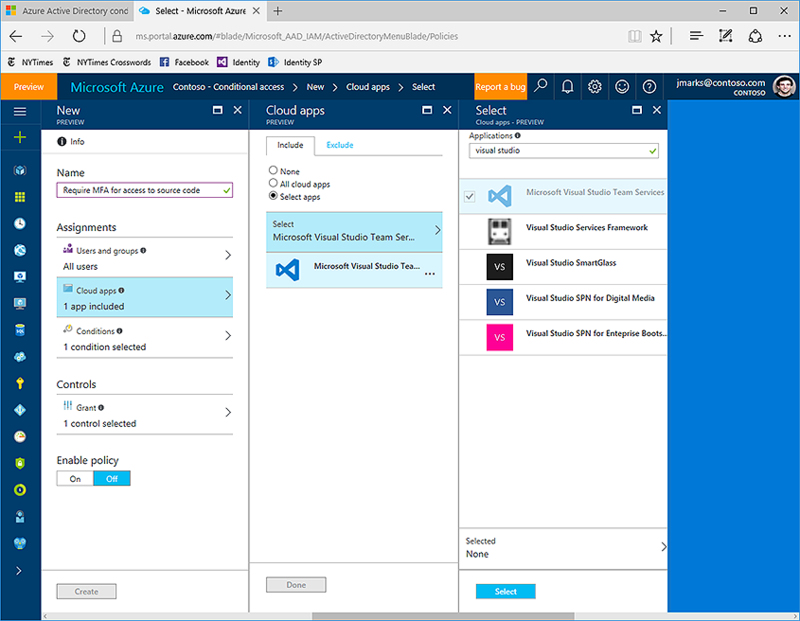 This lets enterprises control where and how their users can access VSTS. Visit the Microsoft Azure documentation site to learn more about conditional access policy (CAP). NOTE: CAP is enforced when a user signs into VSTS with their AAD credentials. Therefore, subsequent accesses to VSTS via mechanisms including personal access tokens, alternate authentication, OAuth and SSH keys do not fall under conditional access policy. We have now moved all the Team Services accounts from the agent-based pricing model to pipeline-based pricing model. In this new model, users can run as many builds or releases concurrently as the number of pipelines configured in their account. Additional builds and releases beyond this limit are queued and wait for earlier builds and releases to complete. The Pipelines queue feature provides users with more visibility into where their builds or releases are. Builds and releases waiting for a pipeline to execute and their position in the waiting queue. Builds and releases currently running using available pipelines. 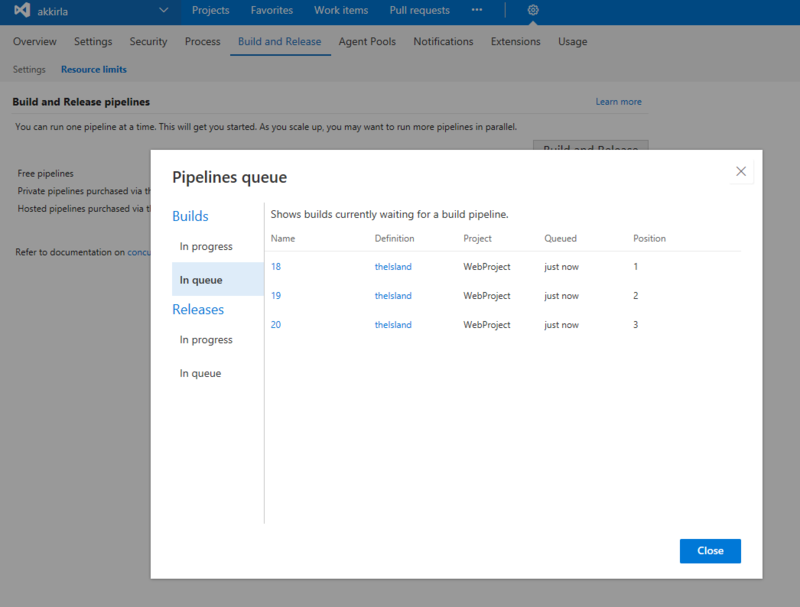 While your build/release is waiting for a pipeline, you can also directly launch this view from inside the build/release logs page and find its current position in the pipeline queue and other details. We think these features will help improve your workflows while addressing feedback, but we would love to hear what you think. Please don’t hesitate to send a smile or frown through the web portal, or send other comments through the Team Services Developer Community. As always, if you have ideas on things you’d like to see us prioritize, head over to UserVoice to add your idea or vote for an existing one.